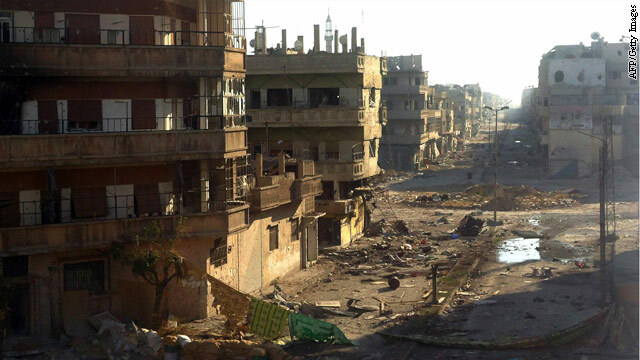 A handout picture released by the Syrian opposition's Shaam News Network on July 13, 2012 shows destruction in Homs Karm Shamsham neighbourhood on July 12, 2012. Facing a "serious escalation" of violence in Syria, the chief United Nations organization that coordinates emergency aid is warning that more Syrian civilians will die if contributing nations do not follow through and fund its relief operation. "We have used the terminology 'appalling,' 'desperate' and 'deplorable,' says John Ging, operations director and chair of the Syria Humanitarian Forum for the United Nations Office for the Coordination of Humanitarian Affairs. "We have run out of language to describe how it is for the civilian population. It is physical and it is psychological." Humanitarian agencies such as the World Food Program, the United Nations Children's Fund and the World Health Organization, Ging says, have launched a major operation in Syria but are facing "an incredibly complex and dangerous situation to develop networks to be able to deliver to the areas that have been affected by the conflict." A senior U.N. humanitarian officer who briefed reporters Friday on the situation in Syria said there has been a "breakthrough" in dealing with the Syrian government. "Bureaucratic delay and obstructions, the officer said, "have been largely removed." One of the biggest obstacles right now, OCHA's John Ging says in a statement, is lack of international funding. OCHA's appeals are only 20% funded at the moment, he says, and "that means they are 80% short." OCHA's coordination work is funded from the United Nations' regular budget, member states' voluntary contributions and private donations. "There has been a limited donor base supporting humanitarian operations in Syria over the last number of months," Ging says, "and that donor base has to be expanded, otherwise we will not be able to continue our delivery and our scale-up." Next Monday, in Geneva, the United Nations is holding the 4th Syrian Humanitarian Forum and Ging says he hopes it will mobilize donors. "We hope that coming into the forum we will hear pledges from a broader base of donors that will fill that gap and that, at least, we will be able to deliver the life-saving humanitarian assistance that the civilian population of Syria so desperately need as we await the resolutions of the issues that are causing this conflict." "Of course," Ging adds, "we hope and pray that the conflict will end immediately; its consequences are horrific." Opposition groups say more than 15,000 people have died since the violence began in March 2011. Because of limited journalist access and the incessant fighting, there is no way to know how many Syrians have died from hunger, injuries and illness. Relief groups such as the International Committee of the Red Cross have struggled to reach people in dire need. Syria guts her cities and massacres her citizens. The people need luggage......immigrate, get out of there. I rushed to read this article about "Syria cooperating". Imagine my disappointment. Syria has chemical weapons within a short distance of Israel and that's why a full-scale military operation is not feasible. It's the same reason why North Korea still exists – they have South Korea hostage. See analogy to North Korea, above. Like the name, by the way. But wasn't he a character in the LOTR trilogy who couldn't be bothered to get involved? Kinda works against the spirit of the message you posted. Great goods from you, man. I've keep in mind your stuff prior to and you are simply too elnclxeet. I really like what you've got right here, certainly like what you are stating and the way wherein you say it. You are making it enjoyable and you continue to care for to stay it wise. I can't wait to read much more from you. This is really a terrific web site.Pretty nice post. I simply stumbled upon your weblog and wanted to mention that I have really loved surfing around your weblog posts. In any case I will be subscribing for your rss feed and I hope you write again very soon! theirs a world wide recession on, of course theirs no money. this would seem like the reason to have guns in the first place, to help your neighbor when he is being attacked by a bloodthirsty madman determined to kill him.